"CSX Building, Jacksonville, FL" by George Lansing Taylor Jr.
CSX Building, Jacksonville Fl. The CSX Transportation Building is a high rise building in Jacksonville Fl. CSX is a class I railroad in the US. It is a subsidiary of the CSX Corporation. It is headquartered in Jacksonville, Fl. CSX Transportation was formed on July 1, 1986, as a combining and renaming of Chessie System and Seaboard System Railroad, into one. 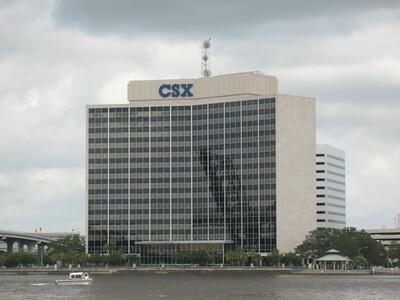 This building is located in downtown Jacksonville, bearing the sign of CSX..